Wow, the treatment has caused me to gain 10 pounds in the past few weeks. Since it’s mostly water, they threw a diuretic into the mix. Thoughtfully, they did it soon enough that “there won’t be any need to look for a gas station washroom every two miles on the way home.” But get up every 30 minutes and drag the IV to the restroom…oh yeah. This being my second Wednesday of IV arsenic for my leukemia, I fell on my face when I came back home just like last week. Is Wednesday some sort of “hit the wall” day. I asked if the effects were cumulative and the med staff dances around before saying, “well, for some people.” I sound crabby. Scott worked his magic by tipping the machine on its side, which drained out a bit more lemonade. Then he put it in the dryer to sit on a sweater rack for 30 minutes at low heat. When the dryer beeped, my little Toshiba was too hot to touch. He put it on the dining room table with a hot pad—no trivet needed—and let it cool. A few hours later, it seemed to be recovered. Then Scott went to a Meetup on WordPress SEO. Introduction to Emily’s Even Weirder Side: I decided to fulfill my daily obligation to walk a mile. That’s not the weird part. There’s an area in the park across the street that’s creepy so I thought I’d bring my phone that has the app Ghost Radar since it never shows anything interesting in our house. My 9-year old grandson recommended the free app on Sunday and I thought it looked fun. http://www.spudpickles.com/GhostRadarLegacy Really, spud pickles? Never mind that the app claims to detect anomalies in the atmosphere and put them on a radar screen. Never mind that words appear as they are supposedly picked out of the airwaves. I am of the belief that even if this app was authored by a band of Nigerian con artists, if a spirit wanted to use it as a communication tool, they might be able to do so. And, after many years of serious paranormal study, I am aware of the perils of creepiness. However, walking the park’s length and back is a mile, so it’s a practical destination. There’s also a hill in the middle that offers a great scenic view. I was determined to reach the top no matter how my heart pounded with arsenic. OK…I get my phone going, wrap myself in protective light and Ghost Radar fails to pick up anything. Half way across the park, I decided to invite my dad to comment on my current battle with leukemia. Blip…I get a blue circle on the radar. “How do you feel about my current situation, Dad?” In relatively quick succession, the words “differ” “for” and “badly” show on the screen. Interesting. There seemed to be some sort of response. Was it a sentence with words dropped out? A few more questions yielded zip. I changed my strategy. Let’s talk to a friend who died of ALS last year. He was a beautiful person who knew how to appreciate life in every way. I questioned about my outcome, but “watch” and “mountain” appeared along with another blue light. It was time to walk to the hill. Cool. I headed to the top with my head down because one never knows what one might step in. “Mountain” stayed on the screen. About half way up, I started getting breathy and “notice” came on the screen. I looked up and found I was exactly at a point where the evening sun hit the top of the hill and shown through the trees. It was spectacular, so I decided to take a photo. “Notice” was still on the screen. 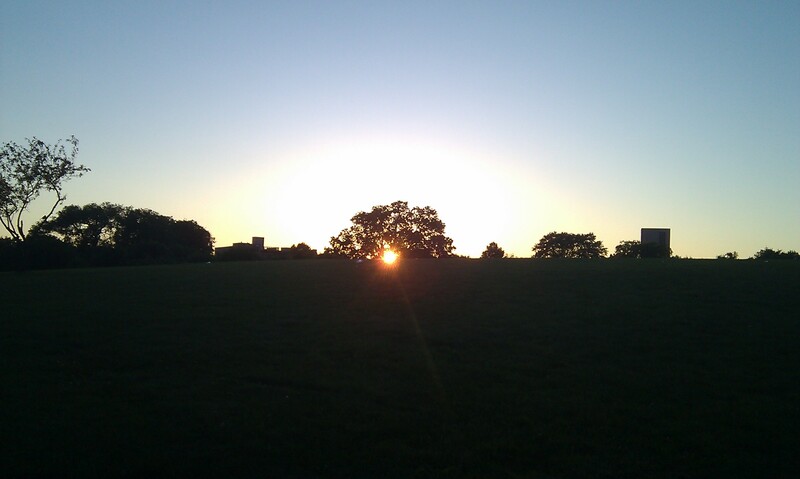 As you can see the photo revealed an aura around the setting sun—that was otherwise undetectable. “Notice” stayed on the screen until I was home. Nice message for anyone. I’m not crabby anymore either.